Designer graduated from PUC-Rio, Ana completed her Masters in Visual Communication at the Pratt Institute, NY, with outstanding merit, before specializing in Branding at Kellogg School of Management. In 2015, she graduated from the course OPM (Owner/President Management Program) at Harvard University. 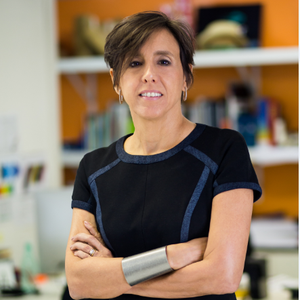 Founder of Ana Couto Branding, in 1993, with the objective to use Design as a tool to build stronger brands, she is involved in every one of the office’s projects, which now has more than 50 multidisciplinary professionals with different backgrounds. Ana has been a Branding reference in Brazil for over 20 years and has created real brand value for clients such as BASF, Beach Park, Buscapé Company, Caixa Seguradora, Frescatto, Itaú Unibanco, P&G, Rio Galeão, Rosa Chá, Somos Educação, Teleperformance, among others. Her industry recognition is reflected through several publications in international Design books and numerous awards, including: Wave Festival (2011); IDEA Brasil (2011, 2013 and 2014); Professional of the Year in Communications––Design, by the Brazilian Propaganda Association––ABP (2013), among others. Ana was also invited to be part of the Cannes Advertising Festival jury (2015). In 2015, Ana Couto opened LAJE, a learning center designed to foster creative experiences with practical tools based on three main themes: Branding, Design Thinking and Innovation.